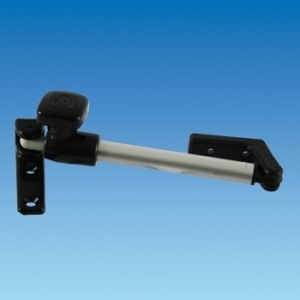 If you are looking to replace a window stay, strut or handle, Caravan Accessory Shop stock a comprehensive range of replacement parts for Polyplastic and Seitz caravan and motorhome windows. For Seitz windows: You will need to measure the height of the window to determine which stay you require. For Polyplastic windows: You will need to measure the window stay - in its closed position. The most popular sizes for tube stays (round) are: 200mm, 230mm or 300m. For auto stays (square), the most popular sizes are: 200mm or 280mm. They are also available with different fittings at the lever lock end: a slide-on fitting (known as Polyfix) or a screw-on fitting. A Polyfix adaptor plate is available in order to fit a slide-on window stay in place of a screw-on version - resulting in a neater job.